Bill Mootos has a gas as Blake Pfeil looks on. Photos: Andrew Brilliant. When it comes to Little Shop of Horrors, the doo-wop musical based on the cult Roger Corman film of the same name, I've always felt something like what the show's characters evince toward "Audrey II," the blood-thirsty plant at the center of the show's action: I'm not really sure how or why it ever came to exist. But then in a way, the sheer improbability of its existence is its raison d'être; in fact librettist Howard Ashman and composer Alan Menken sometimes opined that they were purposefully looking for the strangest source material available when they decided to adapt it. And even for the early days of quirk, they hit solid cult gold with Little Shop, which tells the strange tale of sad-sack florist assistant Seymour, his winsome lady love, Audrey, and her sadistic dentist boyfriend, along with Seymour's man-eating alien plant, Audrey II - who eventually grows to the size of a house and devours the entire cast. Yes, you read that right, that's the plot - and no, it does not make much sense (some of the characters' actions, in fact, are totally inexplicable). But then the script was thrown together on the fly by Roger Corman and his auteurs (and shot in two and a half days) purely to take advantage of some pre-existing sets and an opportunity to squeeze out one more movie before new union rules on residuals went into effect. Yet people have found Little Shop of Horros amusing from the start (original movie trailer above), and it has proved enduring - indeed, believe it or not, it's thirty years old. (Next time you doubt my thesis that the pace of pop culture has slowed to a crawl, remember that - and the source movie is fifty years old.) So it certainly has historical significance; it probably marks the moment when Manhattan's gay, downtown sensibility (which was wreaking havoc in the Village with far more ferocious satires, like Vampire Lesbians of Sodom, at the time of Little Shop's debut) first made a splash - in watered-down form - in the mainstream theatre. Indeed, its success vaulted Ashman and Menken into the arms of Disney, which they quickly gay-ified, too, prior to Ashman's tragic death from AIDS ( to which Audrey II, I've always thought, bears more than a passing symbolic resemblance). Seymour and his two Audreys. 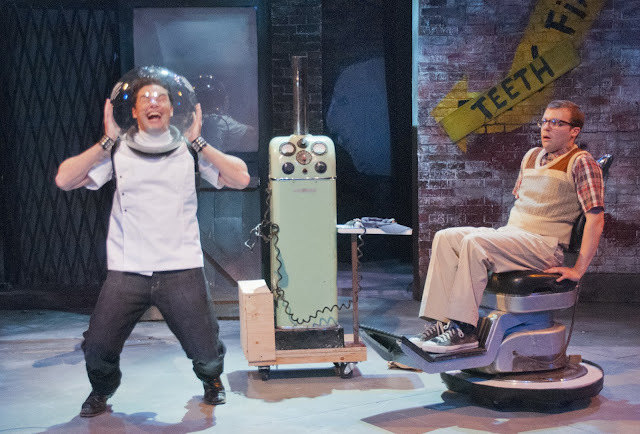 But back to the New Rep, where Little Shop seems like more of a nostalgia trip than ever, as director Russell Garrett is apparently intent on approximating what you might call the standard version of the show. True, this time around two of the trio of girls (named Chiffon, Crystal, and Ronette) who sing a running commentary on the action are white - that's new, I suppose, but I don't think it's supposed to mean anything (hey, the Ronettes were from Spanish Harlem, anyway). Likewise Audrey II, who is traditionally viewed as "black" - kinda like Othello, I guess - is here voiced by the talented Timothy John Smith, a white guy. But again, I don't think that's supposed to "mean" anything, either. Unless it's an unconscious admission that the once hip, outsider kitsch of Little Shop is by now kinda "white," too. But let's leave that crazy talk to Company One, shall we? Most everybody in the New Rep's Little Shop is quite talented and deserves to be onstage, and that's what counts. I was perhaps most taken with Susan Molloy's sweetly fetching Audrey I (although she did muff a few lines on opening night), but Blake Pfeil made a nicely nerdy swain out of Seymour, and these two were surrounded by smart, strong character work from Paul Farwell and particularly Bill Mootos, who etched a witty gallery of skid-row rogues (his sadistic dentist, in the production's one clever new wrinkle, seemed to die from helium, not nitrous oxide). Meanwhile Timothy John Smith made a hearty, hungry Audrey II (her skillful puppeteer was Timothy P. Hoover), and Lovely Hoffman, Jennifer Fogarty and Ceit McCaleb Zweil sang like nightingales and cracked mighty wise as those diversified Chiffons/Crystals/Ronettes. So in the end, this is basically Little Shop as you remember it; the production was a little shaggy on opening night (the sound balance was off in the first half, a few lighting cues were too fast, and at times we could see the wheels on Audrey II), but I have a feeling all that has been ironed out by now. If you're looking for a trip down memory lane, to one of first Broadway avatars of "hip," this is your show.